Positively Amy: Beauty Giveaway With Mademoiselle Michael! 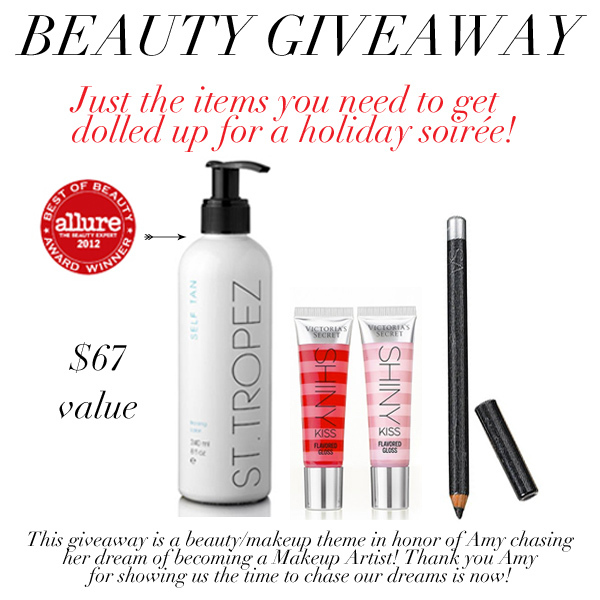 Beauty Giveaway With Mademoiselle Michael! Ladies, ladies, ladies. This is so exciting. Today I have for you, a BEAUTY GIVEAWAY with Mademoiselle Michael. She's the sweetest. And I'm not just saying that in the whole "I'm a blogger so I have to be unconditionally nice" kind of way. I truly mean it. We have email conversations that would blow your mind. Like full novel-style emails. I get really excited when I see her in my inbox. Oh, and guess what else? This Michael lady, she acts. And basically hangs out with Anna Faris for fun. haha "Faris for fun." Alliteration at its finest. You may have seen her in this little number or this one. Guess what else? Even though she's the coolest, she's completely down to earth and easy to talk to. Go check her out and spill your heart out. And don't be afraid to ask for fashion advice while you're at it. This girl knows what's up. See? Like I said, so sweet. Oh, P.S. Know what else is amazing? I knew this pretty lady in real life before we became blogging buds. So it's really extra fun to be partnering with her today! Alright, enough chit chat, go enter! She sounds like such a sweet person!! And that's amazing that she's an actress! I love lip gloss~ That's all I wear. That and chapstick. I've never been a lipstick person. I have literally researched St. Tropez tanner for WEEKS, and just cannot commit to buying it. I would love to win this! Also, I found your blog through Jessica Who? Such a cute layout! I love it! I'll be following now!